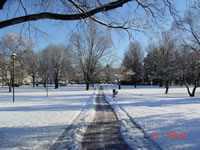 Tompkins Corporation provides quality snow removal services for all types of commercial customers. Our commercial customer's can range from the largest commercial property, condo associations, simple store front parking lots. Please do not waste your time and resources hiring a company with little or no real working experience. I have a proven track record and years of history working the largest snow storms with stellar success for all my customers. I can provide you a quality and prompt snow removal service at a fair and reasonable price. I have the trained and qualified employees, resources, and the equipment on hand to effectively manage and provide the service that you need and within budget. Call me today for a free estimate and see what other companies in your area have already hired me. Tompkins Landscaping & Irrigation is happy to announce a new financing option for our customers. John Deere Credit has authorized the financing of all projects to your home that include “Water saving” irrigation system. You may include other construction, landscaping projects along with your irrigation system and John Deere Credit will finance the entire irrigation system. This new service to you is an added convenience that will create an ease of the investment necessary for your home. Winter weather is only weeks away! Facility and Property managers should be thinking snow right now. Need Landscaping Work? Give us a call! Schedule your sprinkler system startup today! A discount will only offered when prepaying both Spring start up and Fall shutdown by March 1, 2014. May 7 of last year, Tompkins was awarded its GSA Contract. This winter melt the snow and ice off your driveway and walkway without damaging your lawn.